We invite you to explore our selection of Ford F-250 trucks in San Juan Capistrano, CA. See our complete lineup of rugged Ford Super Duty trucks including a variety of Ford F-250 pickups for sale or lease. New Ford F-250 trucks are available in several body styles such as CrewCab, Super Cab and Regular Cab models. Several trim options such as XL, XLT, Lariat and King Ranch® are also available. Our Ford Super Duty truck dealership in San Juan Capistrano has a beautiful selection of new trucks in stock now. We also have many used Ford trucks, often including used Ford F-250 trucks, in our pre-owned vehicle inventory. 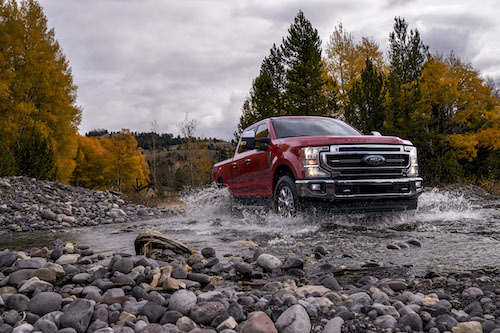 View our inventory of new and used Ford trucks for sale to see available models, photos, trim levels, color options, prices and dealer special offers. For your convenience, we offer several financing options for buying or leasing a Ford F-250 truck in San Juan Capistrano, CA. Our team of Ford financing experts can help you find the perfect truck at the perfect price with factory incentives or current dealer specials. If you would like to learn more about Ford Super Duty trucks, stop by our dealership and test drive the Ford F-250 in San Capistrano, CA.